The way you sleep with your partner reveals telling signs about the state of your relationship. Are you snuggling your way to a split? 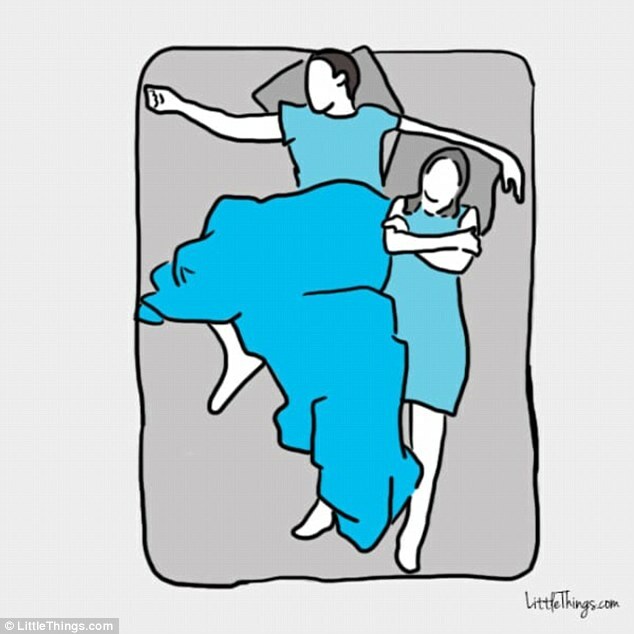 Do you and your significant other sleep in a tangled knot, as a pair of spoons or could you not get further away from each other in the night? Each one of these positions says something about your relationship, and you may be surprised at which are signposts for a happy coupling and which are signs of trouble. According to an article by LittleThings.com, experts say that our body language when we sleep reveals a lot about our unconscious minds – right down to how we really feel about our partners. The first position examined is the classic spooning position – both snug and loose. Spooning in general is considered the sign of a healthy couple – and nearly a third of couples sleep facing the same direction. Relationship psychologist Corrine Sweet told Daily Mail Online earlier this year that only a fifth (18 per cent) of couples actually spoon when they go to bed – despite the position being arguably one of the most traditional. Corrine described it as a ‘traditional position’ that exposes a dynamic ‘where one partner takes a protective stance over the other.’ While other experts describe the position as ‘intimate’ and about trust. Loose spooning, however, is apparently the matured and more secure version of spooning. According to Paul Rosenblatt, author of Two in a Bed: The Social System of Couple Bed Sharing, this manner of sleeping evolves in couples who like to spoon and eventually revert to positions more conducive to quality sleep. However, not only is spooning the sign of a ‘happy couple’ but not spooning can be a sign of trouble in paradise – and more specifically, trouble with intimacy. Relationship expert Tracey Cox told Daily Mail Online that: ‘Few couples hug or spoon during sleep if they’re intimately frustrated or resentful. Also great for intimacy: sleeping naked. Skin-on-skin contact is known to release the hormone oxytocin in the brain – called the ‘cuddle chemical’ – which helps relieve stress. The next covered position is called ‘the chase’, which is similar to spooning, but involves one partner being in pursuit of the other. Lovers who sleep tangled up are among the rarest of sleep partners – only four per cent of couples claim to like it – and while it’s an adorable thought, the practice is not always a good sign. In another variation, tangle sleepers may unhook from each other as they become more comfortable and eventually drift apart. As with the loose spoon, this position is also considered a mark of a more matured, secure relationship than that of the tangled sleepers. Though only eight percent of sleepers adopt this position Corrine said it’s, ‘a compromise between intimacy and independence, allowing for the best of both worlds’. 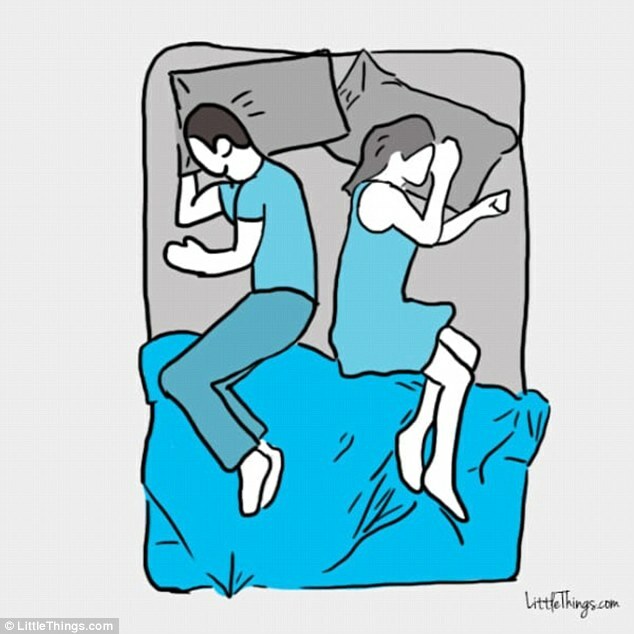 And on the other side of things are the couples who sleep apart from each other and facing away. 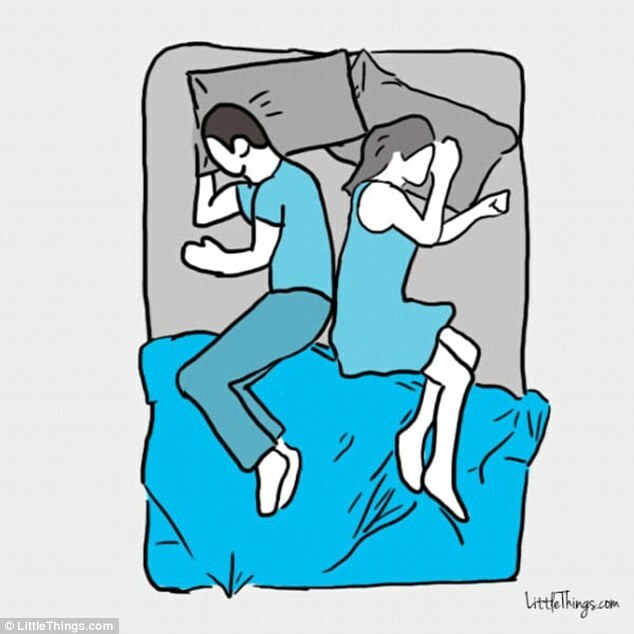 But while this may seem to be the least intimate way for couples to lay together, this is actually one of the healthiest signs for a relationship during sleep. According to Corrine, this position is a signal of couples who are ‘connected and secure in themselves, this position shows both closeness and independence in the relationship.’ It is also one of the more popular positions with 27 per cent of couples opting for the practice. A quarter of couples (23 per cent) like to sleep separately, facing different directions but with their backs touching – and not only is this often a sign of a new romance, but it also shows a good relationship balance. Another position associated with new relationships is ‘the nuzzle’ – where one partner sleeps with their head laid on the others’ chest. A partner who links legs with their partner is in need of an emotional or intimate connection – but also can mean that ‘your lives are intertwined, that you function as a pair’. There is also the ‘space hog’ position, that sees one partner sprawled over the majority of the bed, and can be a sign of selfishness in that partner. Other relationship gauges include sleeping with the heads close, which means they are equals, and if they touch it is a sign of like-mindedness. Those who sleep with their heads close to the headboard are dominant while those with their heads further down are said to be submissive.